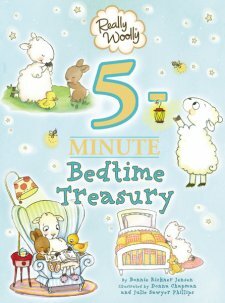 Really Woolly 5-Minute Bedtime Treasury is more than what I was expecting in a bedtime storybook. What I didn't realize was that this book is a bedtime devotional, which is an added bonus. While reading to your child at night is an excellent habit to instill in your young one, establishing a Bible reading routine is even more important. I appreciate how this book includes a a presentation page for those who want to give this book as a gift. It is well laid out with a complete table of contents listing the thirty devotionals. You are then greeted by an introduction for the parents explaining the importance of establishing a bedtime routine. Before you get to the meat of the book you will find two pages where you can write your own prayers for your child. Each night you will have about five minutes of material to share with your child. Each devotional starts out with a short Bible verse and a simple, down to earth explanation that a child could relate to. The next page shares a whimsical poem either that relates to the topic. If a Bible character is mentioned in the poem, such as Noah or Moses, then the following page will encourage the child to read all about that character in the Bible, references included. After that, you will find another entertaining poem for children with a prayer that your child can pray on the opposite page. The final page of each devotional includes a "Bedtime Treasure." This includes a concluding statement, thought provoking question and prayer. I appreciate how well thought out this devotional is. It engages young children in the truths found in the Bible in a way that they can understand. It also provides a routine so that each and every night they know what to expect, great for little ones and their parents to enjoy together! Disclaimer: This post is brought to you by Booklook Bloggers. All thought expressed here are my own.